If you know what “OFWGKTA” stands for, you either know an avid texter, or you live for the thrill of soul-pumping beats. The lengthy acronym belongs to the eclectic, alternative Hip Hop group called, “Odd Future Wolf Gang Kill Them All” from Los Angeles. Their sound joins the ranks of groups defining the music of a generation. Lead by Tyler: The Creator, the group took off in 2007, but it’s not just one band. Odd Future is compiled of different subgroups like “The Jet Age of Tomorrow,” and “MellowHype.” Odd Future shows off the talents of ten eclectic artists from Los Angeles, including Syd the Kyd, Hodgy Beats, Domo Genesis, Left Brain, Jasper Loc, Mike G, and Matt Martian. The group’s success grew exponentially over the last five years with their internet fan base spilling over into crowded venues like London’s “The Drop,” Southern California’s “The House of Blues,” and the annual master-bands weekend, Coachella. OFWGKTA lands this year in the cities of London, Birmingham, Glasgow, and Manchester for their 2012 tour. Loyal Studios and their production crews shot the pilot episode of Loiters Squad in the pre-lit HD greenscreen studio in Burbank California, combining SONY HD camera systems with the 1000 watt playback system that is built into the studio. “Odd Future is on the cutting edge of creativity and free expression. Their talents go beyond Hip Hop into a multilevel entertainment brand. We expect their success to continue to grow as they expand their reach into comedy and television on adult swim.” Says producer Bob Bekian who is also the CEO of Loyal Studios and founder of REALHD.TV. 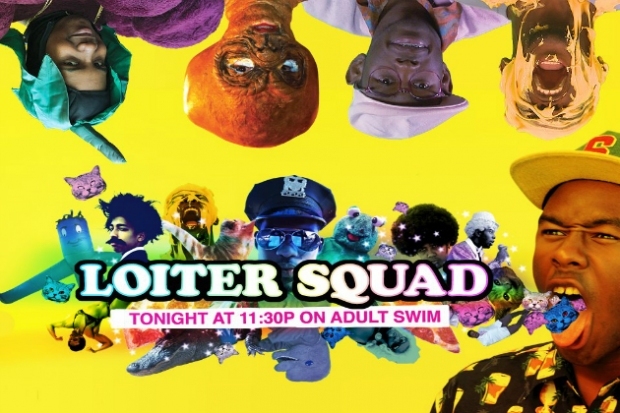 True to feeding the voracious viewers with slightly weird, unique, and unconventional animated or live action entertainment, Adult Swim adds Odd Future to the mix with “Loiter’s Squad.” The show features sketch comedies, pranks, and skits all calling Shenanigans that fans of Adult Swim have come to love. Make sure to check out episodes of Loiter Squad on Adult Swim, every Sunday at 11:30pm. « Robert Pattinson and Kristen Stewart at Cannes Film Festival!